Today April 19, is the anniversary of the election of Cardinal Josef Ratzinger to the Chair of Peter. He would choose the name Benedict XVI. He was elected in 2005 shortly after the death of Blessed John Paul II the Great. Pope Benedict XVI would serve the Church as Pontiff for 8 years before announcing his retirement. 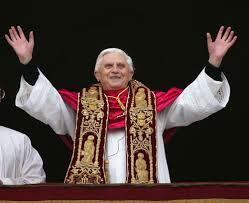 He is now Pope Emeritus Benedict XVI. Thank you Pope Emeritus for your service as Pontiff, and continued service to the Church in a monastery.